Thank you for your continued prayers and partnership in ministry! 2017 was a busy and rewarding year for Horizon, and we praise God for his work in and through us. We added three Education Partners (EPs) last year, and have already added five this year. They are spread across five continents and teach in English, French, Spanish, Portuguese, Russian, and most recently, Romanian. Activity on our Moodle sites also increased last year. 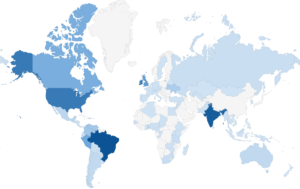 Over 3,000 users from 92 countries used our online learning management system. (The map below highlights those countries in blue.) In addition, Horizon staff and EP faculty members taught over 360 courses in 2017. Rejoice with us in this growth and keep praying for the people behind the numbers! We appreciate your prayers for our professional development efforts, especially for the Effective Online Teaching courses. Last month, my colleague Rob and I taught theological educators from Brazil, Costa Rica, Egypt, Mexico, the United States, and West Africa. We enjoyed interacting with participants as they considered how they might carry out effective ministry training using online and blended educational approaches. Two other colleagues are nearly finished teaching the Portuguese version of the course. One educator in that course wrote, “This is a great challenge for us, for we are the first generation of professors that have before us the first generation of students in the era of [online] technology. May God help us!” Please pray that these educators would be used by God to prepare leaders to serve his church around the world. Please continue to pray as we finish preparations for the first two of ten global training initiatives. The theme for these training opportunities is Transforming Online Theological Education. In April, my colleagues will meet with eight seminaries from across Latin America. In May, I will join my colleagues in Togo for a gathering of seminary leaders from Francophone Africa. Pray for effective communication, a receptive audience, and transformation that results in gospel proclamation. School continues, but I have hit a pothole in my thesis studies. Pray that I can collect the data necessary to make progress. A maxed out the courses he could take before co-op placement, so pray that he will secure a placement for May. Contract faculty at E’s university are on strike, disrupting the semester. Pray that the strike will be resolved quickly. K has decided that she will return to her secondary school for the specialist art program next school year. Pray that this helps provide clarity for future studies. A, G, & L are doing well in school and are enjoying extra-curricular activities. Some of us are sad that ski season is all but over. However, we are all looking forward to the renewal of Spring. Praise God for the many students training on the Horizon platform for gospel ministry. Pray that they would finish well. Praise God for the faculty training to teach online. Pray that for effective use of the tools. Praise God for the opportunity to help transform online theological education in Francophone Africa. Pray that I would listen well. Pray for our family’s intellectual, physical, and spiritual growth. I really enjoyed your March update. Everything sounds exciting with the ministry but I’m sure it’s a lot of hard work. You have ventured into something pretty big, I pray that God will bless your efforts and grant you the faith and courage to keep pressing on. I’m always excited to hear what’s going on with the kids, we’ve known them from such a young age. It’s nice to know how they’re doing. bahula-blog © 2019. All Rights Reserved.